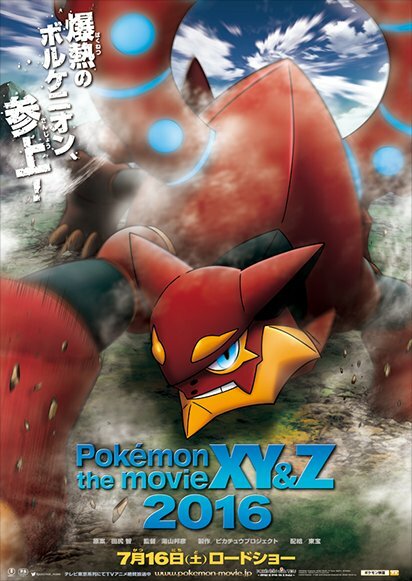 The movie opens with the usual credits featuring many Pokémon, and Alain and Korrina battling, with Mega Lucario vrs. Mega Charizard X. On an airship, two cronies are transporting a large box with Volcanion chasing after them. They comment "He's come to take it back". He lands on deck and begins to battle their Glalie and Alakazam. The two cronies then mega evolve their Pokémon, using "Mega Wave" and a stone on their bracelets, which causes the Pokémon to mega evolve with intense pain. The cronies try to restrain Volcanion with a metallic belt device, but it fails to attach. Mega Glalie freezes Volcanion solid along with the belts and he is tossed off the back of the ship. Ash and Clemont have a practice battle while everyone waits for the laundry to dry. Bunnelby loses to Noivern, then Noivern loses to Luxray. Luxray and Pikachu begin to battle, but the are interrupted as Volcanion crashes to the ground. In the scuffle, the metallic belts get attached to both him and Ash. When Volcanion begins to run away, Ash is dragged along kicking and screaming as Clemont, Serena and Bonnie look on in shock. Meanwhile, the Cronies arrive at a castle at the Azoth Kingdom. They present the item they brought with them to Jarvis, the Minister, and Racel, the prince of the kingdom. Racel is delighted as the box falls away to reveal Magearna. He is in awe of her, but soon Volcanion arrives, still dragging Ash. The cronies and Jarvis use mega wave to evolve Gengar, Alakazam and Glailie, and once again battle and manage to subdue Volcanion. Prince Racel begins to explain to Ash how Magearna was created 500 years ago by the same man who designed the mechanical city, Eliphas, and there is only one of her in the entire world. 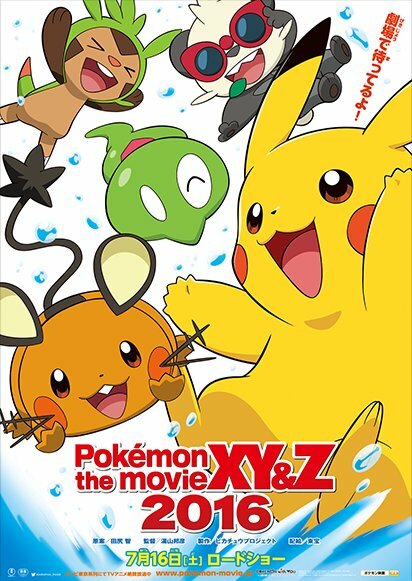 It shows scenes of Pokémon such as Jolteon, Ampharos and Spritzee helping him create her. Then, Ash's Pokémon arrive and save them, helping Ash, Magearna and Volcanion escape. Meanwhile the others have arrived in the city, and Clemont is in total awe, even wandering off onto random elevators and pathways. He tells them about how it was created by Eliphas, who is someone he greatly admires, and the entire city is invention based. Team Rocket, who had climbed up the castle, is discovered by the cronies, Jarvis and Racel. Now safe, hidden under a bridge in the city, Ash greets Magearna, but Volcanion blasts him away with water and says not to touch her. He's then snapped back to Volcanion's side by the belt. As he refills his water stores from a nearby lake, he explains to Ash that he hates humans, and would do anything to keep Magearna safe. Then they are discovered by Clemont, Serena and Bonnie. Jarvis listens as Team Rocket explains they know all about Ash. Clemont is honored to meet one of the actual inventions of Eliphas. He can't get the belt off Ash, shorting out his Aipom arm in the effort. Magearna approaches, and when he tries to touch her, Volcanion threatens him and blasts Ash away again, then he is tugged back in by the belt. Magearna approaches Clemont again and presents him with flowers, which delights him. Magearna also gives Volcanion flowers, which causes him to sneeze and explode. She falls into the water and Clemont helps pull her out, then comments she's extremely heavy, causing her to look away in embarrassment. Serena and Bonnie yell at him for saying the wrong thing to a girl, and Clemont wails and apologizes. The princess of the kingdom, Kimia, argues with Racel about how much time he spends with Jarvis, and that it's as important to learn new things as much as it is to learn about the past. He refuses to listen. Serena and Bonnie dress up Magearna with bows and she poses for the boys. Ash and Volcanion, still stuck together, continue to argue. Clemont has made Ash a huge protective suit to keep him from getting banged around when Volcanion explodes and runs around. Team Rocket agrees to join up with Jarvis and Racel to get Magearna back. They appear with Heracross and Pinsir, which Bonnie yells out are not their usual Pokémon. They say they aren't working alone, and mega evolve them using the mega wave. Everyone can see the Pokémon suffering during the change, and yell at Team Rocket that mega evolution is about a strong bond between trainer and Pokémon. Team Rocket says mega wave is a way to evolve without that strong bond. Ash, Volcanion, and Pikachu battle the Mega Evolved Pokémon while the others run away to protect Magearna. They promptly fall into a trap, and Team Rocket finds them there, having left the Mega Evolved Pokémon behind in battle. Suddenly, a shiny Gardevoir appears, mega evolves with the help of her trainer, the Princess, and saves them, blasting Team Rocket away. Volcanion wins against against the Mega Evolved Pokémon and the group all rejoins. The princess explains to Magearna that she is a descendant of its creator, Eliphas, and reminds Magearna is reminded of a girl she knew long ago. The princess warns them her brother has been completely brainwashed by Jarvis who wants Magearna back at all costs. As this is happening, they are being spied on by Jarvis' two cronies. As they walk, a Fletchling appears and chirps to Volcanion. They find a hurt Amaura, and it's obvious it was attacked by a hunter. As they help it, the hunter appears driving a huge car, but due to a sudden fog, the hunter crashes and destroys his car. They all arrive at Volcanion and Magearna's home, a vast meadow, but the Pokémon living there are terrified of them and hide, as they have all been mistreated by humans. Volcanion is annoyed, but allows the humans to heal Amaura. Magearna soothes everyone by playing a music box song. All the trainers release their Pokémon and they begin to play together. Volcanion, who was also hurt in battle, goes to soak in a gigantic hot springs, of course dragging Ash along with him. Clemont cries out a warning, but it's too late, and the suit he made Ash soaks up water and explodes. Clemont, helping the princess fix up her airship, also works on figuring out how to solve the belt problem. He discovers it can be broken with the help of a Gulpin's poison spit. Volcanion has seemingly begun to soften a bit, talking to Ash about how he watches over the whole meadow from his cave overlooking it all. They eat breakfast together, and Clemont brings Gulpin to help break their belts. It works, and Volcanion instantly tells Ash to get lost. Ash hugs the Gulpin tightly in thanks, and it panics and hides behind Volcanion in terror. Ash is sorry for scaring it, and Volcanion explains this Gulpin was thrown out by its trainer, but before it was let go, it was hugged very tightly, so it hates hugs now. The cronies turn up at the meadow, using Gengar to cover everything in a black fog. They attack and half the Pokémon are trapped in black bands, which cause them intense pain. Jarvis and Racel are in the airship. Magearna is warned if she doesn't come with them, they'll continue to hurt everyone. Volcanion, trapped as well, cannot get to her before she decides to go with them to save everyone else. Once she is with them, Racel is very relieved, but then they use a coordinated hyper beam attack to attempt to kill everyone left down below, and are sure it worked. Racel is horrified as he is afraid everyone, including his sister, is dead, and Jarvis explains he has been betraying him the entire time. He yanks the Soul Heart from Magearna, her entire chest piece, and she shuts down and goes limp and lifeless. He cruelly tells Racel that Magearna is dead, and throws her lifeless body from the ship before putting Racel to sleep with Hypnosis. Even Team Rocket is horrified by everything they see, Meowth crying. Volcanion and the others survived the hyper beam attack with force fields. They find Magearna's lifeless body. Volcanion is heartbroken, and tells the story of how he first met her in the flower fields in that meadow. He remembers her with her paint peeling off, sitting and caring for the Pokémon living there, all traumatized by humans. She was the only one who wasn't afraid or affected by his explosions, as she can curl up into a ball. He hoists her body onto his back. They decide to get the Soul Heart back. Jarvis explains how the Soul Heart will power Eliphas' great airship. He activates it, and the castle rises out of the city into the air. The princess appears on her own ship, and Jarvis is shocked she is alive. He attempts to fire the weapon powered by the Soul Heart, but Magearna, still alive inside of it, refuses to fire. She can remember how the weapon burned the whole town and caused much suffering, and Eliphas was saddened that what he built to protect, had destroyed instead, and tell her to go away from that place to protect herself and the city. The cronies unleash tons of Pokémon, all painfully forced to evolve through mega wave. 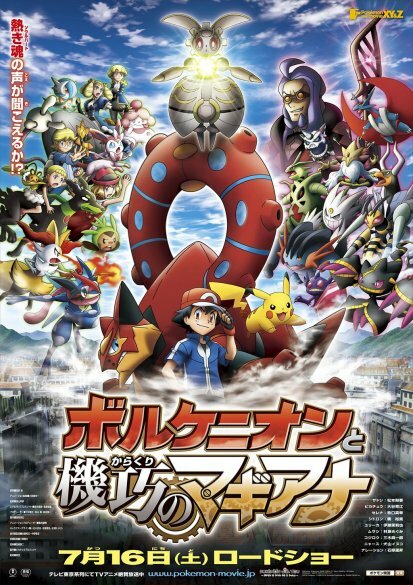 Volcanion tries to battle them all, and Ash and friends arrive to help. Ash and Volcanion head off while the rest hold off the Mega Evolved Pokémon. Squishy turns to 10% Forme to help. They burst into Jarvis's lair, but are captured in the black bands and tortured. Jarvis tries to fire the weapon again, this time having Gengar use Mean Look on the Soul Heart first, subduing Magearna even more as Meowth cries over the suffering he can hear from her. The weapon fires, exploding and burning a huge area of the meadow. Everyone watching is horrified, and Meowth cries harder as Magearna's voice goes completely dead from the Soul Heart. The weapon fires again, on all the people and Pokémon, and they all try to ward it off with attacks. Squishy then takes on Perfect Form, completely blocking the weapon's attack. Volcanion is infuriated enough to break apart the pain bands and charge. Ash manages to grab Jarvis' staff, cramming it between some gears and smashing the jewel inside, which apparently controlled all mega wave evolutions. Gengar returns to normal, then runs away. All the other Pokémon that had been battling down below as well, also all return to normal and flee. Jarvis attempts to flee, but falls off the ship instead. Clemont, Serena and Bonnie make it up to the ship where they retrieve the Soul Heart, but Magearna has completely gone from it. The ship also begins to fall then. They aren't sure what to do, as if it crashes, it will crash into the meadow and kill all the Pokémon. Volcanion says he could make an explosion big enough to destroy it, but Ash says he would then die. Volcanion agrees they should all return together, recharges his water. Racel, now awake, apologizes for how stupid he had been. Ash tells him he should really go on a Pokémon journey and see the world, and learn new things, as he has only studied the past with Jarvis. They escape on the Princess' airship. As they fly off, Volcanion jumps off back onto the weapon, intending to sacrifice himself. He runs to the center of the weapon, and apologizes for being unable to protect Magearna. Then he explodes, destroying the entire weapon before it can crash. Down in the meadow, everyone is mourning Volcanion and Magearna, despite the rest of them and the meadow being safe. Magearna awakens when the Soul Heart is replaced, but her soul was broken, so she is a simple robot with no more personality. Everyone is even more heartbroken. Soon, a white fog envelopes them all, and Volcanion appears, having survived the explosion and the fall somehow. He is weak, though. Magearna suddenly begins to blink back to herself, approaching him and becoming excited, her personality returning. She presents him flowers, and he sneezes. Everyone is delighted and relieved both of them seem to be safe. Volcanion tells Pikachu to always protect Ash, now seemingly having decided some humans are okay. Team Rocket watches from the bushes, happy everything is back to normal. Ash and company head back to the city, and Bonnie proposes to the Princess' assistant. The Pokémon back in the meadow clean up the wreckage of the weapon airship, burying it in a large hole. The cronies are in jail, and Jarvis, having survived somehow, is also apprehended. Ash and friends leave the city, waving goodbye. Racel leaves soon after, with his Slurpuff, taking Ash's advice to go out on a Pokémon journey.